Enchong Dee admits he has always admired 'Growing Up' star Julia Montes. Although they have reportedly been seen going out lately, Maria la Del Barrio hunk Enchong Dee said that Julia Montes is not his girlfriend despite having admitted that he has a crush on her. “Agad-agad? Bigyan niyo naman ako ng pagkakataon manligaw (laughs). Hindi ko masasabi kung siya eh (laughs). Close kami. We’re happy. Hindi lang kami nagkikita for awhile. Siguro mas padalagahin pa natin siya, ganun. (laughs). Hindi pa kami. Hindi pa naman. Siguro kapag 18 na siguro siya. Sinabi ko na naman sa kanya yun na may crush ako sa kanya,” he said. To stress the point, the 22-year-old actor said he has not even had the chance to hold hands with the Julia. “Wala pa nga. Siguro kung dati natuloy siguro mahaba-haba na. bata pa siya eh,” he said during his launch as Nutrilife’s newest celebrity endorser last October 22 at the 55 Events Place in Quezon City. 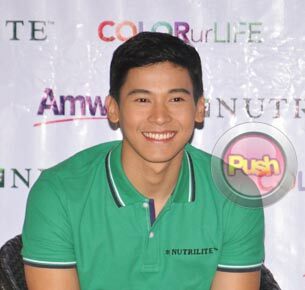 According to Enchong, he is happy with his single status at the moment and is not in any rush to court Julia. “Huwag na muna. Basta ang masasabi ko lang masaya ako na not necessarily having a girlfriend or having a relationship naman yun eh. Basta yung inspiration lang para uuwi ka masaya ka, yung mga ganun,” he shared. Enchong said he is not shy in admitting that he has always had a crush on the Julia. “Oo, definitely. Definitely may admiration. Hindi naman makakaila yun, sino ba namang hindi ‘di ba?” Enchong explained. Enchong also defended Julia when pressed if she is the one who does not want to make their reported relationship public yet. “Kasi wala pa naman. Siguro kapag meron na. We’re willing to open up. Oo naman. Aaminin namin,” he stressed. Although he has had girlfriends in the past before joining show business, Enchong admitted a relationship with Julia will be a first for him. “If ever, sa showbiz. Siya yung magiging first girlfriend. Sana. (laughs). I had one girlfriend sa swimming, then one nung college pa,” he revealed. Although he will be doing a show abroad during his birthday this coming November 5, Enchong said that he is not expecting anything from his new inspiration although he jokes that it would be a great gift to finally receive approval from Julia. “Oo ba, kung sasagutin ako, ano na (laughs). Nung galing siya ng tour may binigay na siya sa akin eh. Pabango. Okay na ako sa pabango,” he joked. When asked what he plans to do for himself this year, Enchong revealed that he wants to be adventurous on his 23rd birthday. “Wish ko talaga mag-skydive pero hindi ko alam kung saan kasi once-in-a-lifetime experience yun. Or kapag hindi ako payagan ng mga tao sa paligid ko (laughs) siguro gusto ko yung langoy with the dolphins sa Subic,” he said.